I fell into acute cookbook exploitation mode two weekends ago, and I spent some careful time thumbing through my Better Homes cookbook. I had two goals. One was to make it up to my old warhorse cookbook after recently making some condescending remarks about it in my Mexicali Pork Chops post. Sure, Better Homes may reach a bit when it comes to ethnic recipes, but this cookbook really tries hard. And it just sits there on the shelf--it doesn't ever hurt anybody. Why did I insult it? I'm sorry. After I finished this heartfelt conversation with an inanimate cookbook, I settled on my other goal: to find a really simple and quick recipe that would feed us a for few days. What I found, right in the middle of the most humble cookbook in my kitchen, were the seeds of the most humble, simple and delicious soup ever. "Better than chicken soup if you ask me," was Laura's verdict. Swish! Heat oil in a large pot over medium heat. Add onions, celery, thyme, salt, pepper and bay leaf and saute on medium for 5-7 minutes. Add the kielbasa, water and beans and bring to a boil. Simmer for 45 minutes. Serve immediately. Serves 4 easily. Can be easily doubled (or tripled!). 1) This soup was so preposterously easy and so laughably cheap that it literally burst off the page (don't you just love when that happens?). And the recipe is so scalable that it can be doubled or tripled with minimal extra effort. A textbook 80/20 recipe. 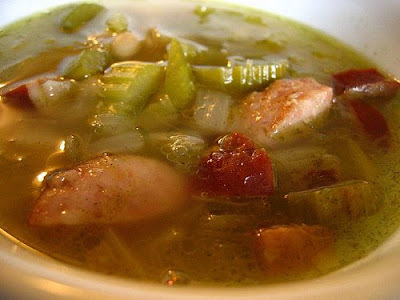 2) Keep in mind, if you make this soup with kielbasa, you will not be making a diet soup. It will be more on the energy-dense side. 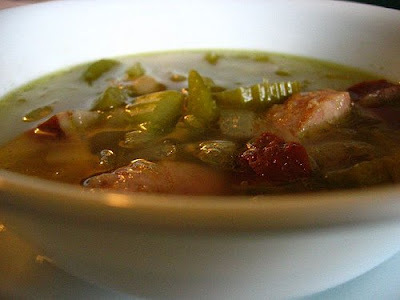 If you want a lower-fat soup, you can add less meat, or replace the kielbasa with relatively lean cuts of ham to the soup. 3) Finally, let me quantify the laughable cheapness of this recipe, because it just doesn't seem believable that a soup this good can be this inexpensive to make. A delicious and easy-to-make soup, all for the staggering cost of 77c per serving! This soups sounds like it tastes great, and will be simple to cook. 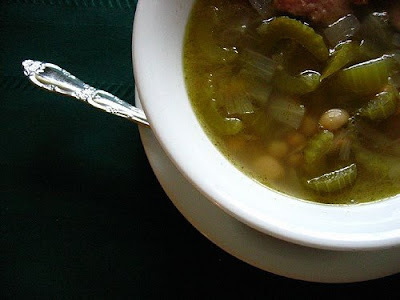 It reminds me of the split pea soup recipe you had up here a few months ago. Very cheap. Yummy! 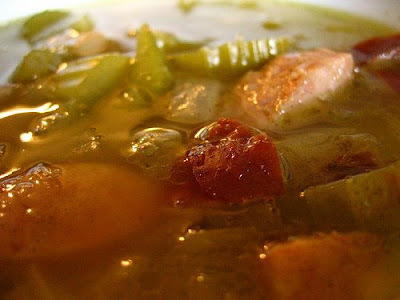 The only thing I changed is I added chicken broth cubes - tasted a little thin without it.